Two solo home runs accounting for all the Eagles runs. Jones pretty much single handedly beat the Lions. I guess he was celebrating his 37th birthday a day early. - BBM is putting out what I suspect will be the first of at least two sets to celebrate the 80th Anniversary of professional baseball in Japan. I'm not quite sure what to call the set so I'm going to go with "80th Anniversary Pitchers". As you might expect from that name, the set will exclusively feature pitchers, both OB and current. The set contains 99 cards - 90 player cards and a nine card subset that I think is for pitching records. 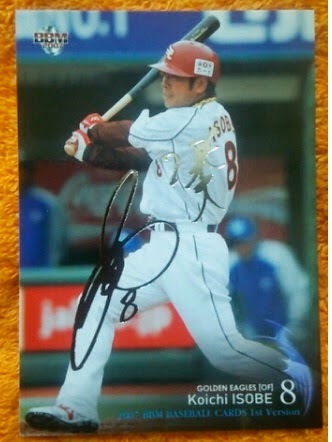 The Google translation is a bit confusing but I think that instead of any insert cards there are foil signature parallel cards available as well as actual autograph cards. The set will be out in late May. 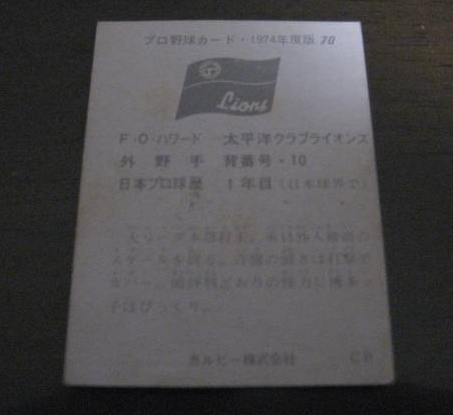 - In 1975 the Hiroshima Toyo Carp won their first ever Central League pennant. 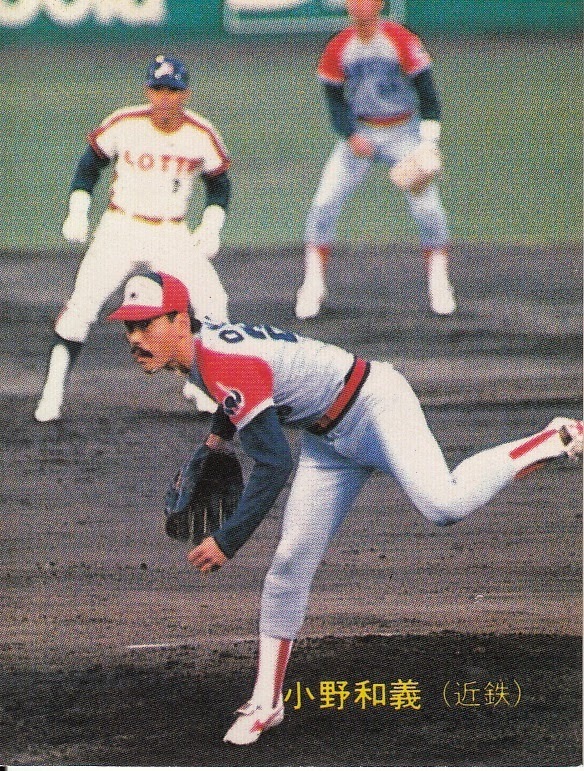 They followed this up with five more pennants in the following 16 years - 1979, 1980, 1984, 1986 and 1991, winning the Nippon Series in 1979, 1980 and 1984. To celebrate the 40th Anniversary (yeah, I know, it's really the 40th season since 1975) of their first pennant, Epoch is putting out a box set featuring Carp players and managers from all six pennant winners. The set will contain 55 cards - 54 base set cards plus one "special" card - I think they are only autograph cards but I'm not positive. I'm also not entirely sure if Epoch is putting this out on their own or in conjunction with the OB Club/Japan Baseball Promotion Association. The set will be released on May 24. 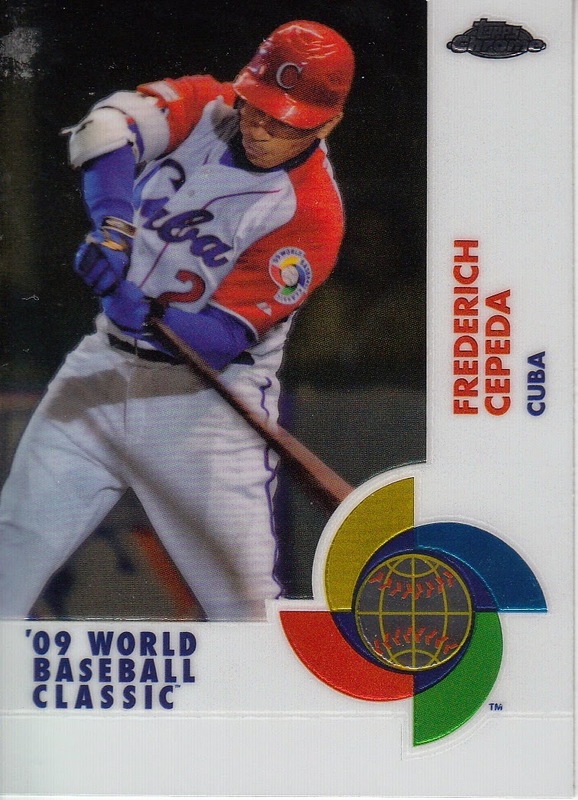 Some interesting news in the past week - the Giants have signed Cuban outfielder Frederich Cepeda to a one year contract. Cepeda is expected to join the team in mid May. A year or so ago, the Cuban government announced that it would allow its athletes to play overseas professionally without defecting. Cepeda is the first baseball player to take advantage of this policy. Given the current relationship (or more accurately lack of relationship) between the US and Cuba, I'm not surprised that it's a Japanese baseball team that is signing the first player. 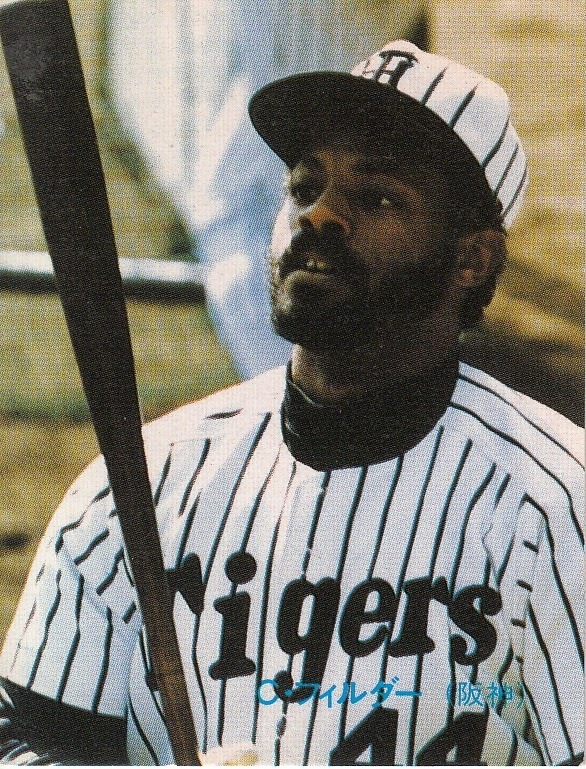 Cepeda is not the first player that the Cuban government has allowed to play in Japan, however. 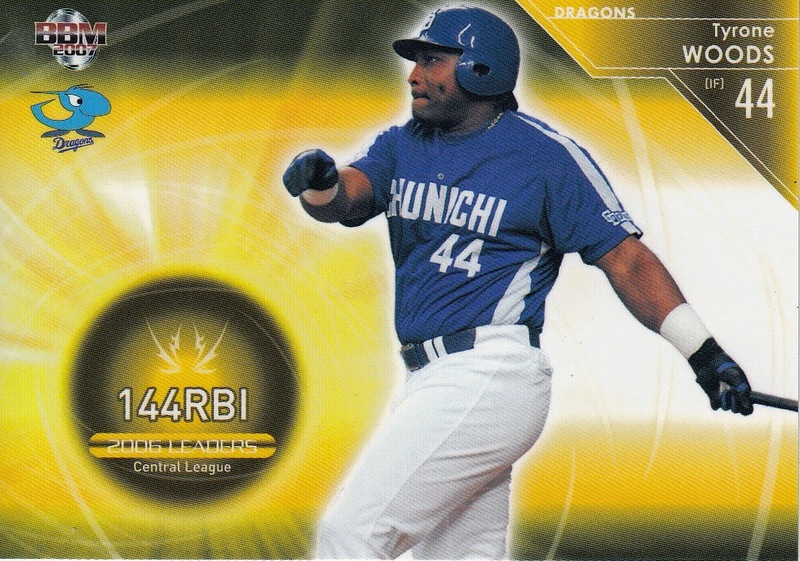 Cuban legend Omar Linares spent three years with the Dragons back in 2002-04. At the same time, Antonio Pacheco and Orestes Kindelan played for Shidax, an industrial league team managed by the then-exiled Katsuya Nomura. It'll be kind of interesting as the Giants already have a Cuban player - Leslie Anderson. 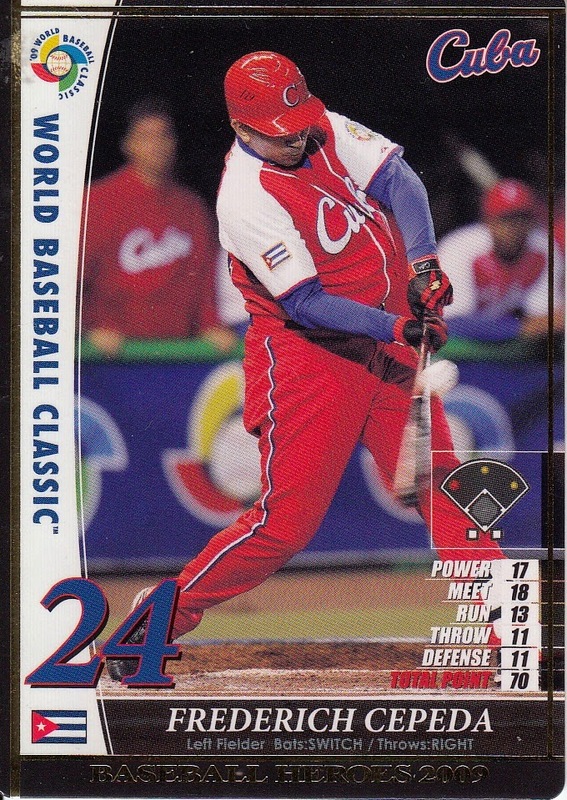 Anderson was a teammate of Cepeda's on the 2006 and 2009 World Baseball Classic teams but he defected in late 2009. 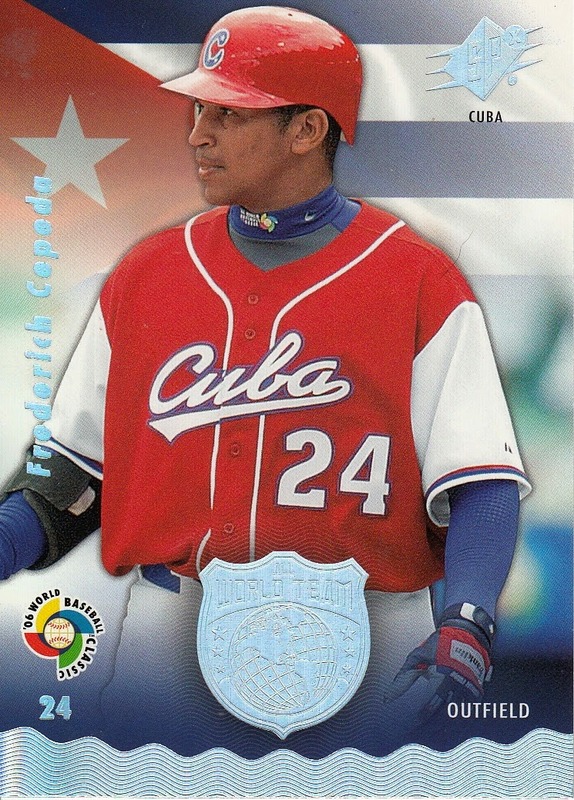 Cepeda has played for the Cuban team in all three WBCs and has a number of baseball cards in the various WBC sets. 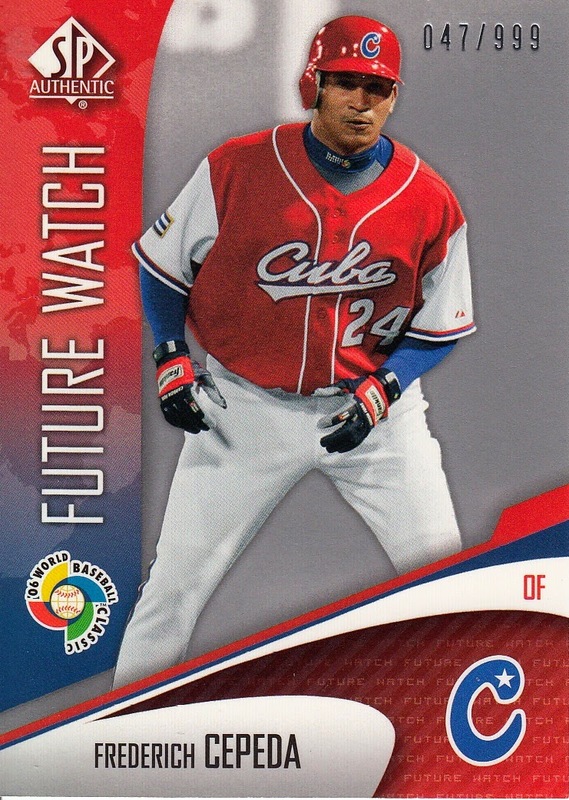 For the 2006 tournament, he had six cards - one in each of the "Inaugural Images", "World Future Stars", "All World Team", "WBC Moments", "Future Watch" and "Counterparts" sets plus at least one jersey card. 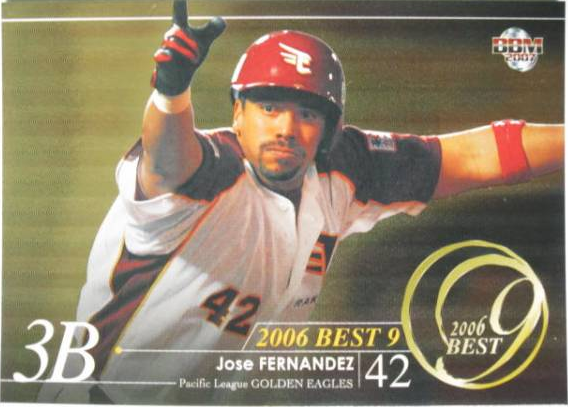 For the 2009 edition, he again had 6 cards - one in the Topps 2 WBC insert set, one of the box toppers from the Allen & Ginters set, one in the eTopps set, one in the Topps Chrome WBC insert set, one in the Bowman Chrome WBC insert set and one in the Bowman Draft Picks WBC insert set along with a number of parallel and memorabilia cards. 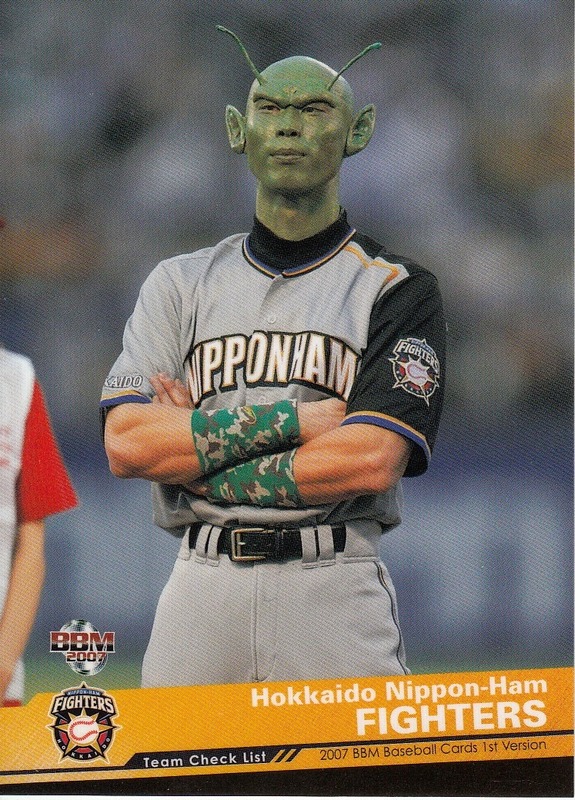 He also appeared in Konami's WBC Heroes set with both a regular and a "All Tournament Team" insert card. 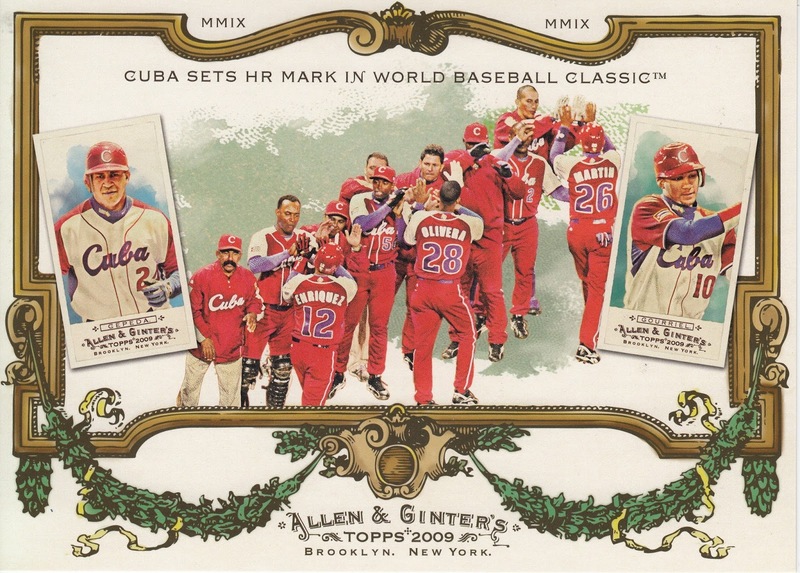 He did not have a regular card in last year's Topps Tribute WBC set but he has a number of memorabilia cards in the product. It will be interesting to see what cards Cepeda will have with the Giants. His mid-May arrival should be just in time for him to make it into the BBM 2nd Version set. I have not seen any announcement for BBM's Giants team set yet so it may be published late enough that it will be able to include him. I wouldn't expect him to appear in a Calbee set until Series Three. Of course, that's assuming that he's allowed to have cards. 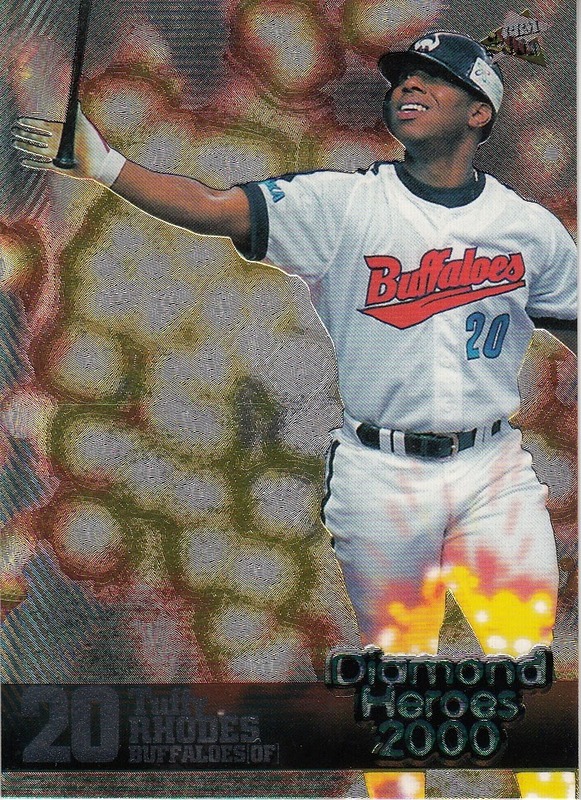 Omar Linares did not have any BBM cards until 2004, his final year in Japan and he never had a Calbee card at all. 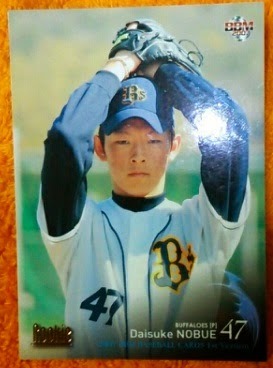 He had two cards in 2003 - one in the Konami set and one in an oddball Dragons deck of cards issued by Chunichi Sports. Here's a little video of Hiromitsu Kadota throwing out the first pitch at one of the Osaka Classic games between the Hawks and Buffaloes last year at Osaka Dome. 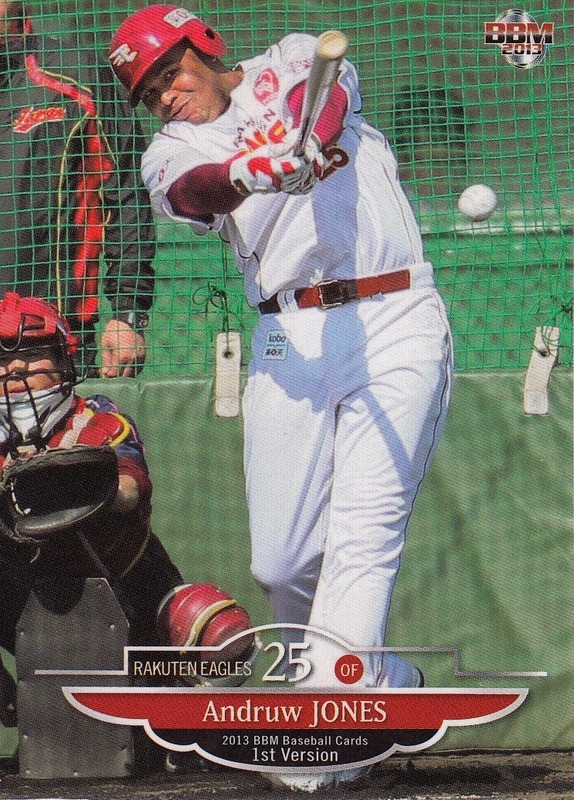 Both teams wore 1980's uniforms - the Hawks wore Nankai Hawks uniforms while Orix wore Kintetsu Buffaloes uniforms (Kintetsu being the team Orix assimilated in 2004). 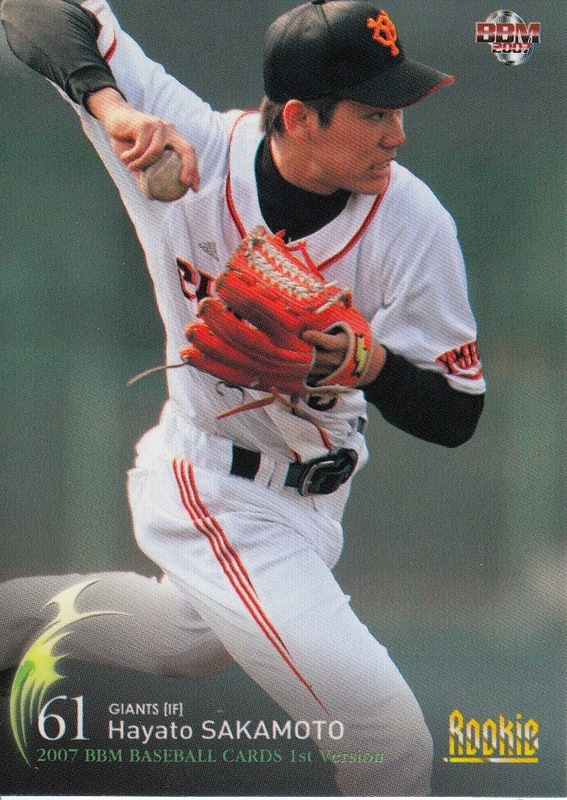 Kadota is best known for playing for Nankai but he actually did spend two seasons with Orix so that he could remain in Osaka after the Hawks moved to Fukuoka. What I like most about this clip is towards the end when Kadota's walking off the field and finally there's no music or announcements being played and he can hear the Oendan section cheering "Kadota...Kadota...Kadota", the way they did for him when he played at Osaka Stadium back in the 1970's and 80's. Kadota stops, turns, takes off his cap and waves to them. It's just a nice little touch. 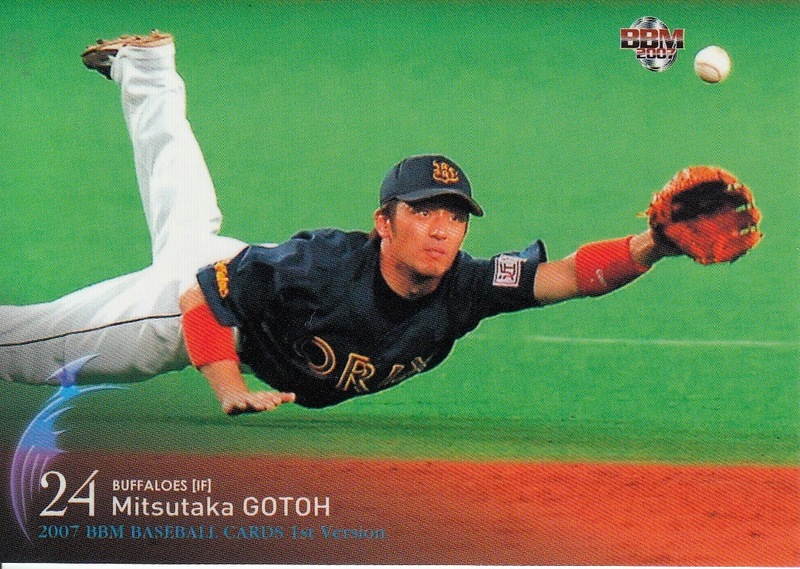 This is without a question one of the worst pictures ever used for a baseball card. Jason mentioned that it was so bad that it looked like it was a video capture or a picture taken of a TV screen. 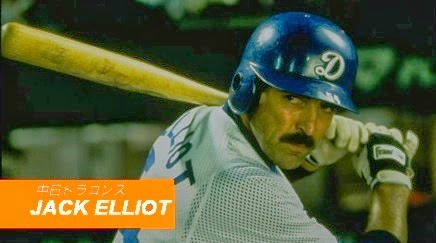 Sean had left a comment on a post the other day that mentioned that there was a page for Calbee baseball cards on the Japanese edition of Wikipedia. 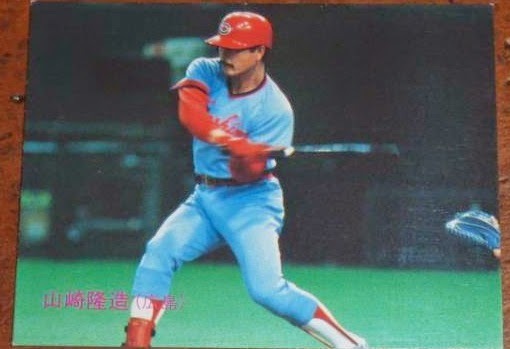 While looking over the Google translation of the page, I came across some text about the 1988 set that appears to say that Calbee did in fact actually use pictures of players on TV on some of the cards. After I pointed it out to Sean, he confirmed that that's what the text really said. The website appears to go into a bit of detail regarding the use of TV images. Again, I'm trying to make sense of the Google translation (and the page gets rearranged somewhat by the translation) but I think that the author is saying that the pictures from the cards are from the opening series for the season. I think this is a prime example of how lazy a card company that doesn't have any competition can get. With the 2007 set, BBM put their parallel issues into overdrive. 108 cards have five different versions - silver, gold, "kira hologram", "1 of 1", and "Metallic" (Light packs). The "1 of 1" cards appear to be a "chrome" version with a blue circle on the front (with the words "1 of 1" in it). There are also 87 rookie cards (which I think is all of them) with a parallel version in which the word "Rookie" on the front of the card is in embossed gold. The Masahiro Tanaka card (#211) has all six parallels while the Kenta Maeda and Hayato Sakamoto cards only have the "Rookie" parallel. There were only two other subsets in the set besides the Leaders subset. 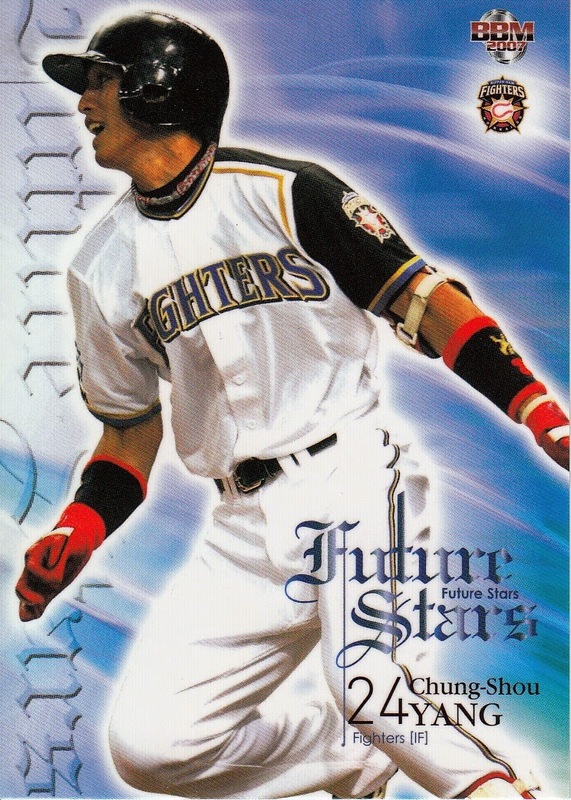 The first was a 12 card "Future Stars" subset that featured a bunch of promising young players - one from each team. The players were Tomoaki Egawa, Ryosuke Hirata, Yoshihisa Naruse, Hisanori Nishitani, Takahiro Okada (T-Okada), Yuki Saitoh (not Yu-Chan, the one with the Carp), Ginjiro Sumitani, Yusuke Takahashi, Shinichi Takeuchi, Takanobu Tsujiuchi, Shun Yamaguchi and Chung-Shou Yang (aka Daikan Yoh). The other subset was called "Record Achievers" and featured milestones reached during the 2006 season. Once again, there were 12 cards - one for each team. The players included were Atsuya Furuta (1000th run scored), Tomoaki Kanemoto (350th home run), Kazuhiro Kiyohara (12th game ending home run), Masahide Kobayashi (200th save), Tomonori Maeda (3000th total base), Nobuhiko Matsunaka (250th home run), Daisuke Matsuzaka (100th win), Daisuke Miura (1500th strikeout), Koji Uehara (100th win), Tomoya Yagi (nohitter), Masahiro Yamamoto (nohitter) and Toyohiko Yoshida (600th appearance). - BBM has announced four more team sets for this year - the Buffaloes, the Lions, the Fighters and the Baystars. 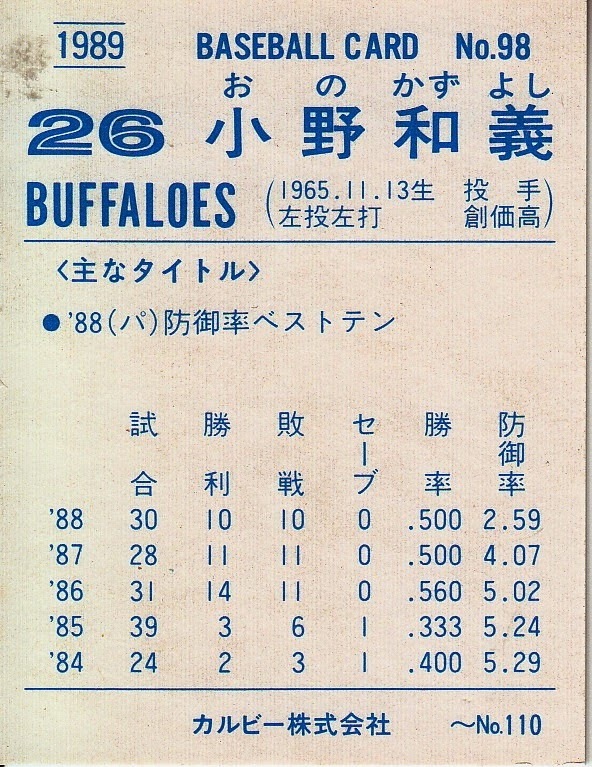 The base set for each of the four sets is a little smaller than what has been normal the past few years - instead of 99 cards, the Buffaloes, Lions and Fighters sets only have 90 cards while the Baystars set only has 81. Each set has a 9 card insert set associated with it and a number of possible autograph cards. The Buffaloes set was released last week while the other three will not be out until mid to late May. - In late April BBM will release a 25 card box set called "Speed And Smart" that I think is dedicated to the best base runners. Surprisingly, the 24 cards in the base set are not split evenly between active and OB players - there will be 14 active players and only 10 OB players. Obviously this means BBM is departing from their normal "every team gets the same number of players" template. The 25th card is (as usual) a "special" card that could be a die-cut card, a facsimile autographed card or a real autographed card. 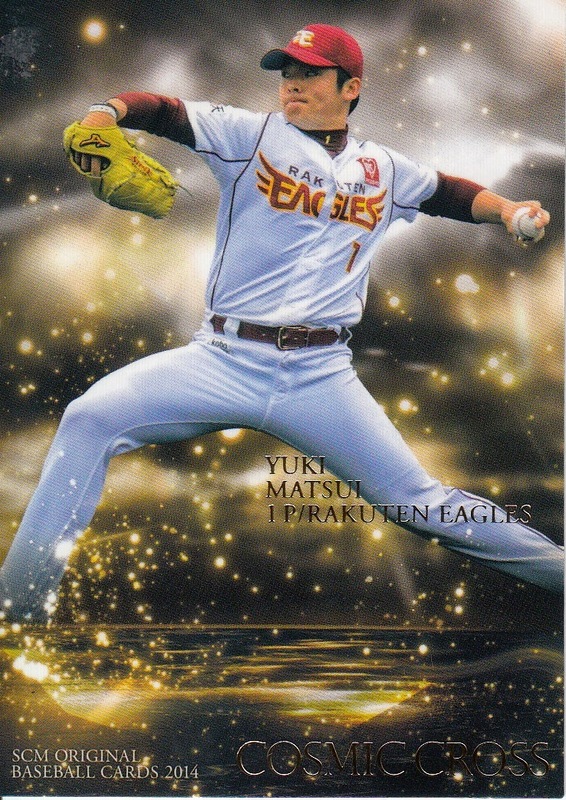 - Front Runner Trading Cards is releasing their fourth "Rookie And Young Stars" team set for 2014, this time for the Baystars. I think the set will contain 26 cards - the 25 card base set plus one autograph card. The set will be out next week. 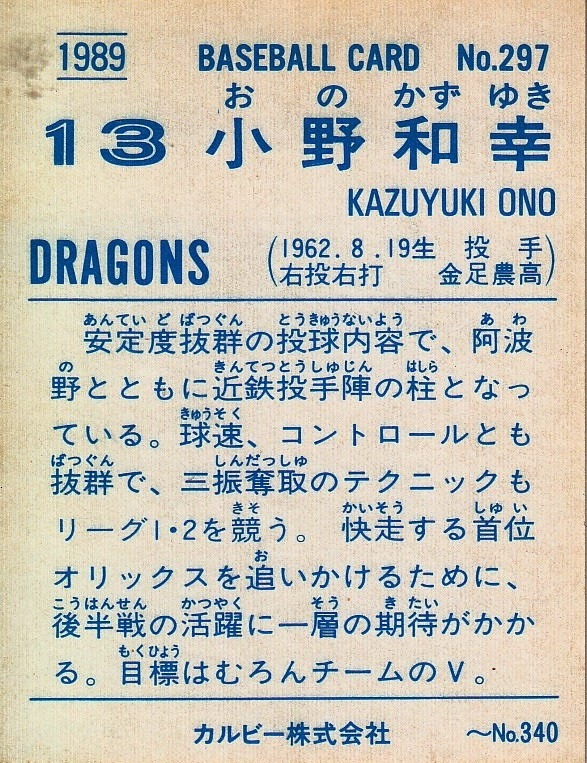 The "West Special" cards were a set or subset that Calbee did in 1998 that only contained cards of players on teams in the "western part of Japan" which in this case means west of Kanto - Nagoya (Dragons), the Osaka-area (Blue Wave, Buffaloes, Tigers), Hiroshima (Carp) and Fukuoka (Hawks). 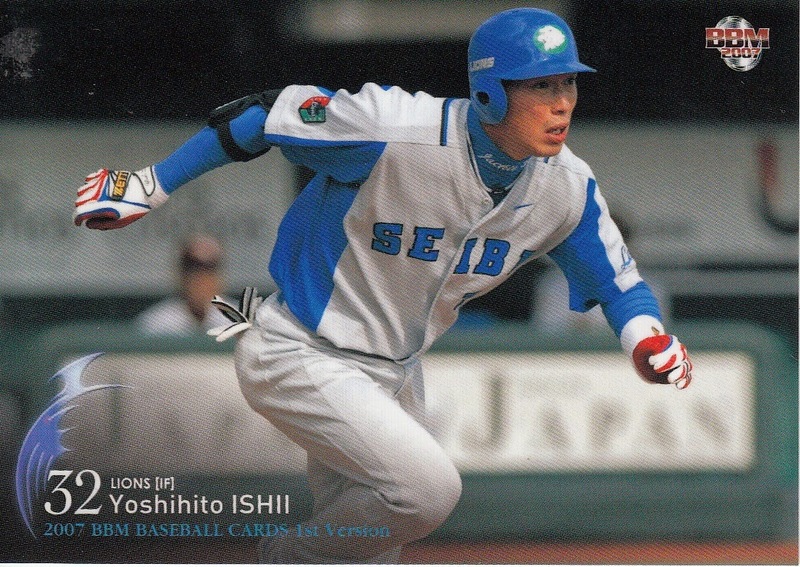 I don't know if these were sold separately from the regular cards that year (like the 1994 Calbee Hokkaido cards were) or if this was just a subset/insert set with the regular cards. After getting some emails from Scott Kaneko earlier this week regarding information that had appeared in Sports Card Magazine about both the Frank Howard and Cecil Fielder Calbee cards, I decided that I really needed to look into how I could get the magazine here in the States. I've gotten a few issues in the past, but only because my friend in Japan that I order cards from sometimes includes one with my order as a bonus gift. While this is extremely generous of him, I never know when or if I'm going to get an issue. So I decided to embark on a quest this week to see how I could do this. The first, obvious, step was to ask Scott if he had a subscription and how he went about doing getting it. He quickly confirmed my fears - there's no way to get a direct subscription with BBM for the magazine here in the States and he had an arrangement with a Japanese book store that was local to him in California. Since I live in a suburban/rural area midway between Philadelphia and Baltimore, I don't have a lot of options when it comes to Japanese book stores. Some Google searches brought me a couple of options but none that looked particularly promising. There used to be a Japanese book store in Rockville, MD (~90 minutes drive) but it closed a few years ago. The best possibility was a Mitsuwa store in Edgewater, NJ (2 1/2 hour drive) which seemed a bit of a long way to go. And I never got a response from them regarding whether or not they carried or could carry the magazine. So Scott's option really didn't seem like a possibility for me. Next I checked a couple of on line stores that I've used for buying cards. AmiAmi does not carry it. My initial search on Rakuten Global Market didn't find any issues either (more on that in a bit). I decided then to take a look at Amazon's Japanese site. A quick search showed that they had several issues, including the most recent issue (#104). So I decided "what the hell, what have a got to lose" and decided to see what I could do. I attempted to log into the site using my US Amazon account. That didn't work. But I could create a new account on the Japanese site. Once I did that, I added issue #104 to my shopping cart and went to check out. I entered my shipping address and the site accepted it, telling me that shipping for the magazine would be around $12. I was a little concerned that I would need a Japanese bank credit card but it accepted my US MasterCard without blinking. I pressed the button to submit the order and, surprisingly, the site told me everything was good and my order was submitted. The total price was $30.20 - $18.12 for the magazine and $12.08 for the shipping. The $18.12 was actually a little lower than the 1944 yen cover price of the magazine (which is what it's listing for now). The magazine price has gone up quite a bit in the last two issues (it was 1000 yen last year) because instead of including 2 to 7 promo cards in each issue, they're now including 12. What was truly amazing is that the $12.08 was for Amazon's Global shipping which apparently uses DHL and/or EMS. I ordered the magazine Monday afternoon. It was delivered to my house Wednesday afternoon - roughly 48 hours after I submitted the order. Nice! Monday evening I got a heads up from Scott that I had missed the Sports Card Magazines at Rakuten Global Market - they didn't show up in searches but they were in the category "Toys & Games->Hobbies->Trading Cards->Sports->Other". I decided that I'd see what ordering magazines from Rakuten was like. I found two issues that I was interested in - #100 from last fall (which both Scott and Ryan had told me included the full Calbee checklists since 1973) and #103 from earlier this year (which had 12 promo cards including the first six of the "Cosmic Cross" cards - more about them later). The total for the two issues was around $25 but that was before shipping was included. Now if you've ever ordered from Rakuten you know that the single most frustrating thing about them is that they don't tell you what the shipping will be before they charge you. I took a look at the "estimated" shipping and figured that two magazines would probably be about $12 for shipping, same as Amazon. Imagine my surprise Tuesday morning when I got an email from Rakuten telling me that they had charged me almost $25 for shipping! My two magazines were going to run me $50! Ugh. On the positive side, however, Rakuten shipped EMS so I had the magazines in hand by yesterday. But this is the fourth time I've ordered from Rakuten and the second time that I've really felt burned by the shipping charge. So the question now is going forward, if I decide that I want to continue to get the new issues, how should I do it? I think Amazon is going to be the way to go. I've been experimenting with putting items in my shopping cart and seeing if I would be able to order the items and what the shipping would be if I can. I've discovered that there appear to be three classes of items (beyond just the Sports Card Magazines) at Amazon Japan. First, there are items that are directly sold by Amazon (like the issue I bought). Shipping to the US for these items appears to start at $12. I put both issues #103 and #104 (the only two issues being sold directly by Amazon) in the shopping cart and got a shipping cost of $16, about two thirds of what Rakuten was charging me. The second class of items are items that are sold by third parties but are "fulfilled by Amazon". It looks like shipping for these items starts at around $30 (via "International Express"). The final class of items are items that are simply sold by third parties through Amazon. There's no way to ship these items to the US and unfortunately, this category contains all the boxes of baseball cards that I've found on the site. What this means is that there are any number of interesting publications that are actually available for purchase from the US. 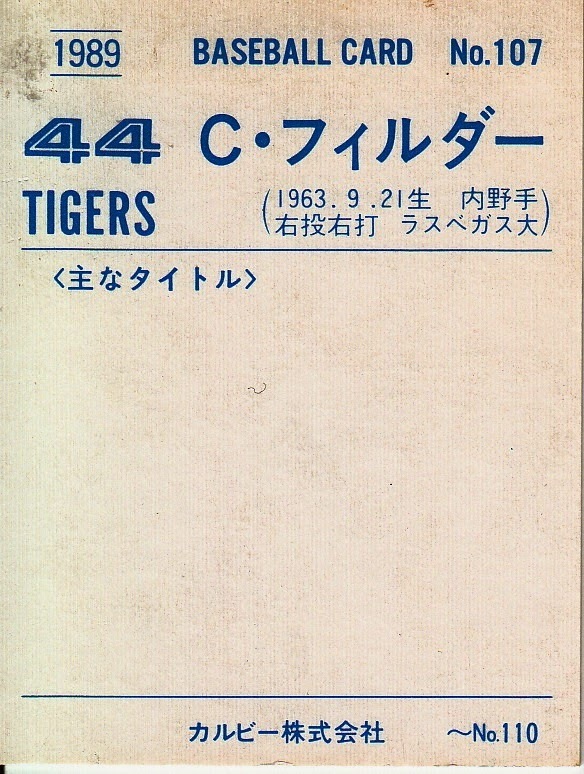 For example, there's a successor to "The History Of Uniform" called "The Nippon Professional Baseball Uniform Chronicle" that you can order. Ryan had picked up a couple mooks last fall for me that I would have ordered myself had I realized that I could. This opens up a whole new world, limited really only by my ability to read what I order. Oh, and by the way, there's a helpful link on the top of the Amazon Japan page that says "English" - clicking on it will render all (or at least most) of the text on the page in English. It appears to do a better job than having Chrome automatically translate the page. The last thing that I want to mention here is that BBM is doing something different with the promo cards in the magazines this year. 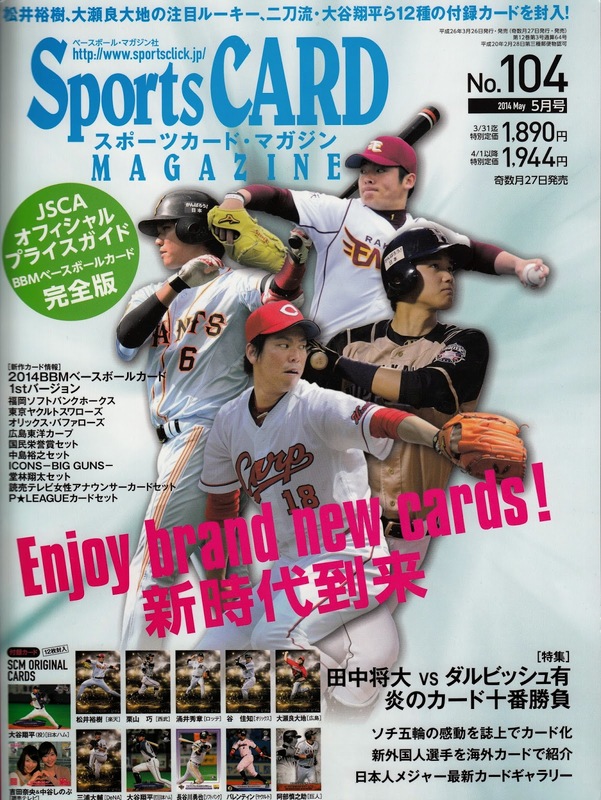 As I said before, there are now 12 cards per magazine instead of the 2 to 7 that they've had previously. Six of the cards appear to be the typical promo cards for new sets. Issue #103 had four cards for the Rookie Edition set plus a sumo and female wrestler card. 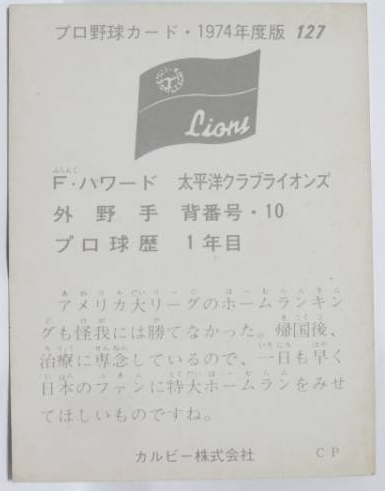 Issue #104 had two cards for 1st Version plus single cards for the Swallows and Hawks team sets, the "Icons - Big Guns" set and the Yomiuri female TV announcer set. You can see all the inserts here. I will point out that SCM is apparently labeling the cards by cover date, so the first two cards listed here are from issue #102 which has a cover date of January 2014 but was actually published in November of 2013. The first issue with the "Cosmic Cross" cards was #103 which was published in January 2014 with a cover date of March 2014. If the magazine keeps with its publishing schedule, the final "Cosmic Cross" cards will be in issue #108 which will be released in November 2014 with a January 2015 cover date. That implies that the final six "Cosmic Cross" cards will have a 2015 date on them. We shall see. I got the most recent issue of Sports Card Magazine (more about that in the next few days) and I realized that I had said something wrong in my preview of this year's 1st Version set. I had said that there would be no team checklists this year but according to the preview material for the set in the magazine, there will be the usual 12 team checklists in the set. And, for the fifth time in the last six years, the theme will be team mascots. *SIGH* This really doesn't make me that much happier about this year's 1st Version set. 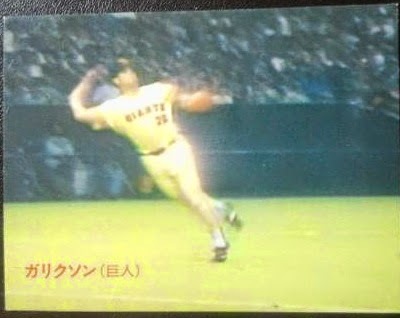 So the other day I got some information from Scott Kaneko regarding that odd Cecil Fielder card from the 1989 Calbee set. Seems that according to the 1989 Calbee checklist included in Sports Card Magazine issue #100, card #107 has both an error and corrected version. I'm assuming that the card I have is the error version and the one with the stats on back is the corrected version. Cards #35 and #66 were for Rod Allen of the Carp and George Hinshaw of the Dragons respectively. 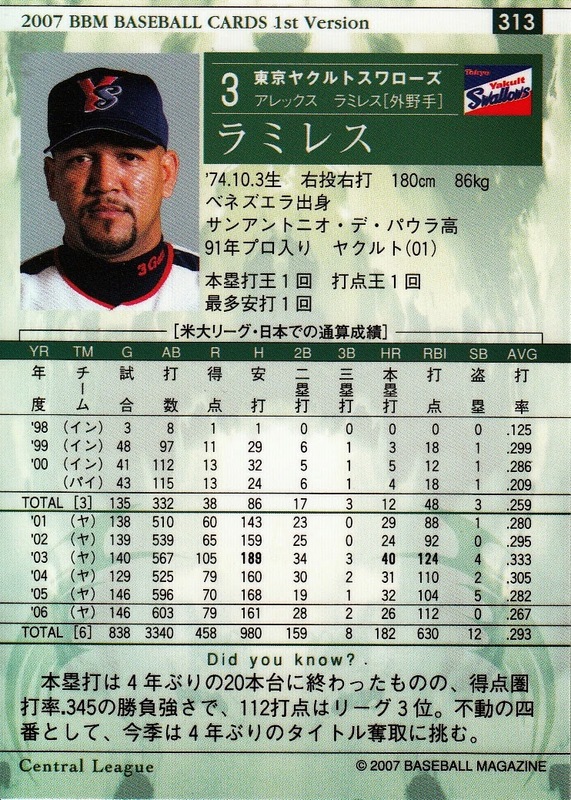 Both of them, like Fielder, were in their first years in Japan so I kind of wonder if Calbee had some issue getting their stats before the cards went to press. 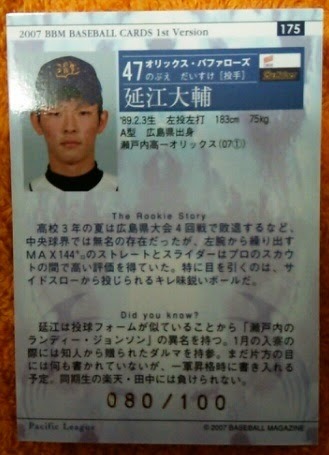 Card #98 was for Kazuyoshi Ono of the Buffaloes. 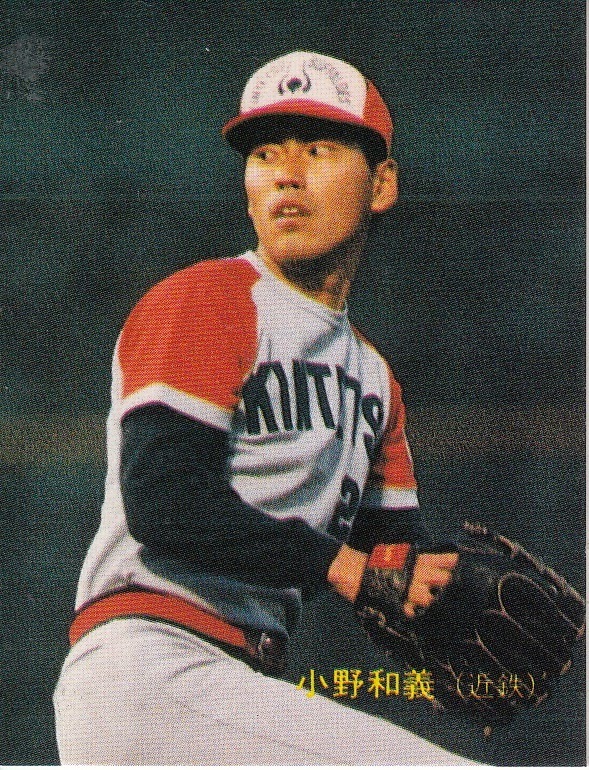 Now when I saw this Monday morning when I got Scott's email, I had remembered that I had a 1989 Calbee card of Ono that was not labelled correctly. So I kind of guessed that that was the error card. But when I finally got around to actually looking at my cards, I discovered something else instead. You can see that beyond the team and the uniform number being wrong, the kanji doesn't match between the front of the card and the back of the card. The checklist does not list this as an error card, or at least does not indicate that it was ever corrected. I do not know if this is the error card or the corrected card. 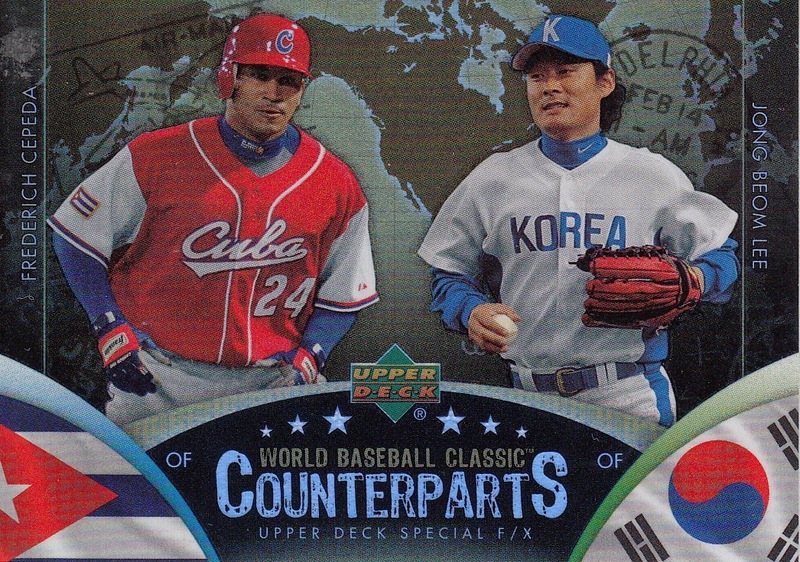 I wonder if card #297 was not the only one where Calbee mixed up the two players (I don't think they were related). One more note - you might notice on the checklist that cards #391-#414 don't have a value associated with them. Sean had mentioned a few months ago that these are gold border cards that are almost impossible to find. I guess they are so rare that SCM won't venture a value. Engel has all of these listed at at least $100 each with several stars (Warren Cromartie, Hiromitsu Ochiai, Choji Murata and Tatsunori Hara among others) going for $200-$300. 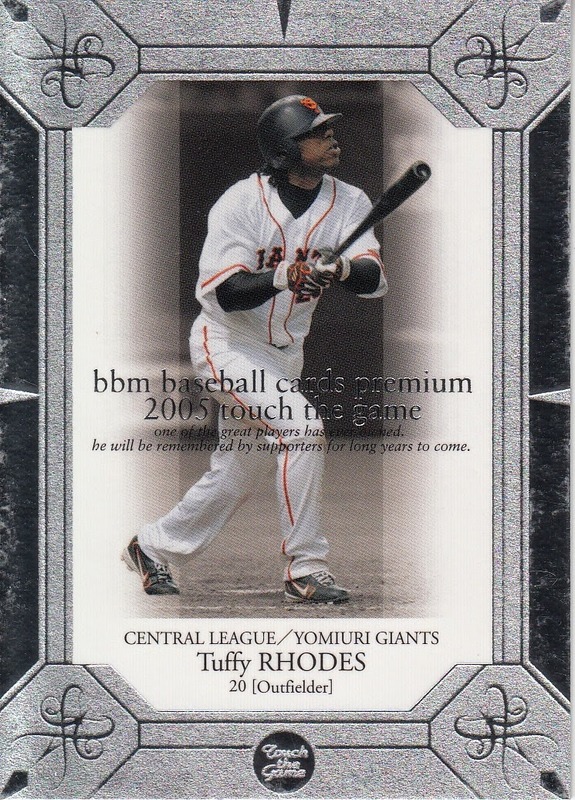 Tuffy Rhodes is, of course, a well known player in Japan. 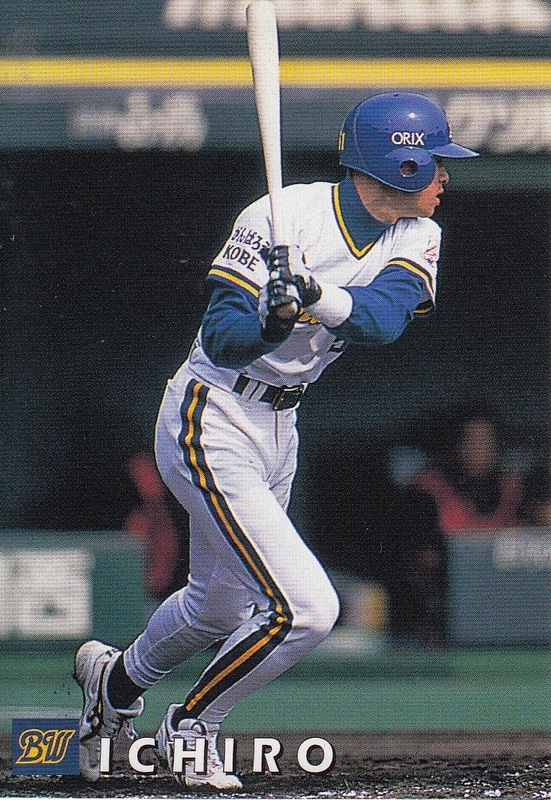 Over the course of his 13 seasons with Kintetsu, Yomiuri and Orix, he hit 464 home runs, the 13th highest total. He was the league leader in home runs four times and league leader in RBIs three times. 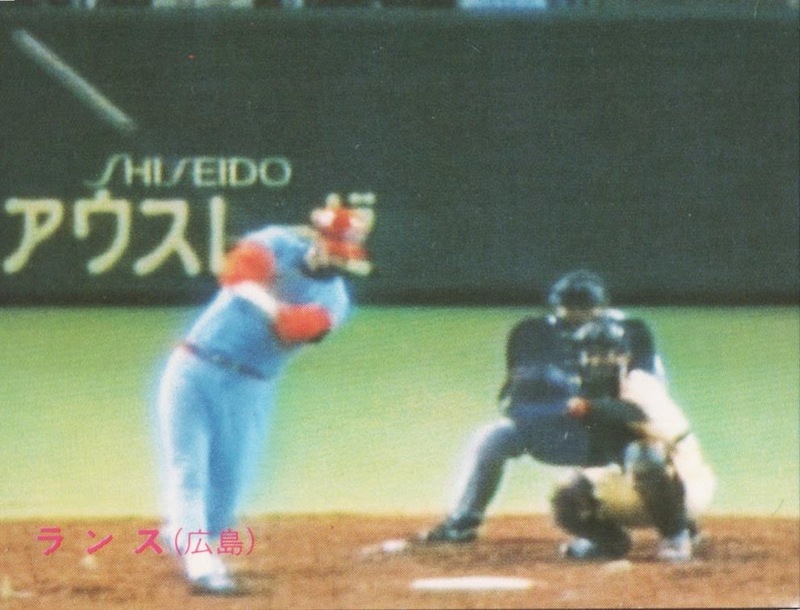 Until last September, he was tied with Sadaharu Oh and Alex Cabrera for most home runs in a season. In the US, however, Rhodes is mostly remembered for an event that happened 20 years ago last Friday. On Opening Day of the 1994 season, Rhodes (then with the Cubs) hit three home runs against the Mets, all coming off of Dwight Gooden. As it turned out, this would be over a third of the home runs he would hit in that strike shortened season (he ended with 8) and almost a quarter of his career MLB total (which was 13). There's a great blog out there called Cards That Never Were that creates custom cards using old card designs. What I mean by that is that the guy behind it will create cards that he felt were missing from classic card sets, usually Topps. For example, he recently had a series of posts regarding Chris Short, a Phillies pitcher from the 1960's who was missing from the pre-1967 Topps sets. He created cards of Short for the 1959-1966 Topps sets. I've known about his blog for a while but I just discovered the other day that he had done a custom card for Frank Howard in the style of the magenta bordered 1975/76 Calbee cards. 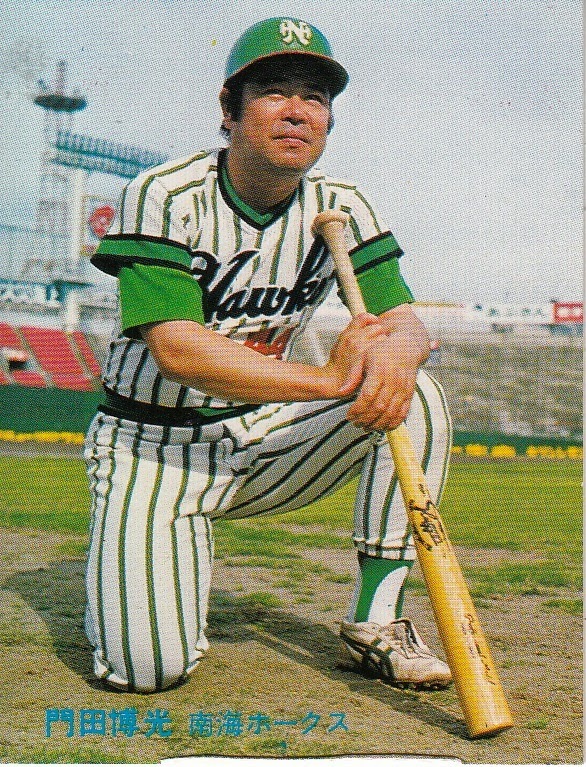 (Howard had signed with the Taiheiyo Club Lions in 1974 but got injured in his first at bat on Opening Day and retired.) It's a cool looking card but I'm going to nit-pick it for a couple of reasons. 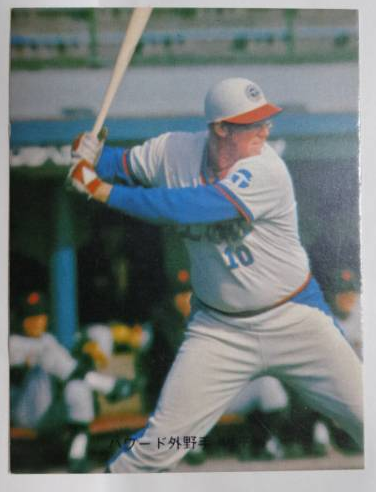 The first is that since Howard did not play in Japan in 1975 or 1976, he would not have had a card in the 1975/76 Calbee set. 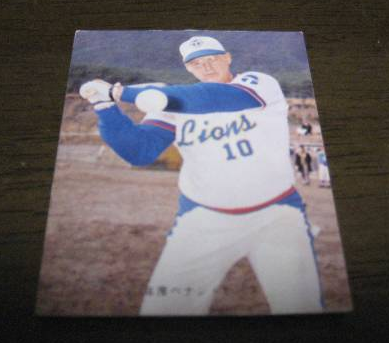 The second reason is that Howard actually had two cards in the 1974/75 Calbee set. In fact, the picture used in the custom 1975/76 card is from one of those cards. Engel's 7th Edition lists the card at $300. It's starting auction bid is 15,000 yen (~$150). Engel lists this one at $900. The auction is starting at 70,000 yen (~$700). 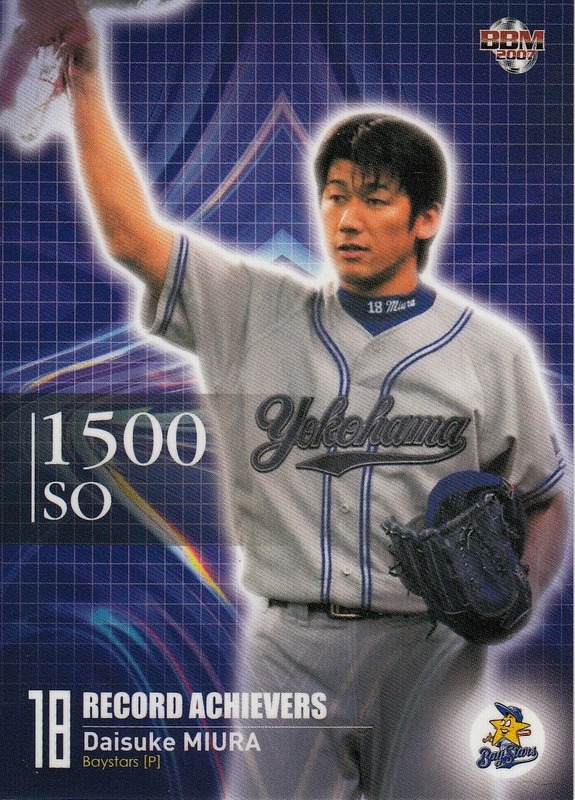 I won't swear to it, but I suspect that this card is the highest price listed for a regular issue Calbee card in Engel. 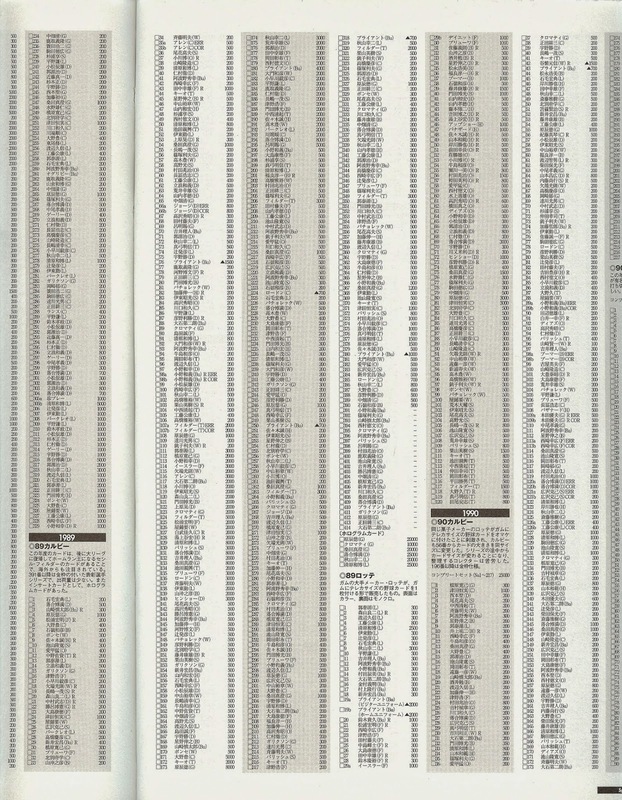 UPDATE: Scott Kaneko sent along some information from Sports Card Magazine #100, which had a complete list and price guide for all the Calbee cards since 1973(!). 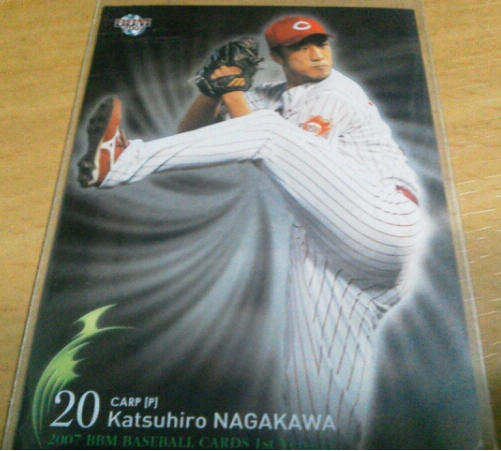 Card #70 is listed at 25000 yen (~$250) and #127 is listed at 50000 yen (~$500). Scott said "In my opinion, this guide is more accurate than Engel’s price guide, however, for the high priced cards, I usually divide by two to get the “true” value [ i.e. what you can sell the card, if you are lucky, on ebay or some other auction site]." Scott also mentioned that the two highest priced Calbee cards in SCM were #s 210 and 211 from the 1973 set. They're both of Wally Yonamine and are listed at 90000 yen (~$900). The Vintage Edition of Engel has them at $600. And just to update the Engel listings for the two cards, the Vintage edition still has #70 at $300 but #127 is now listed at $1200. So...WTF? Why is my card missing the 1988 stats line? 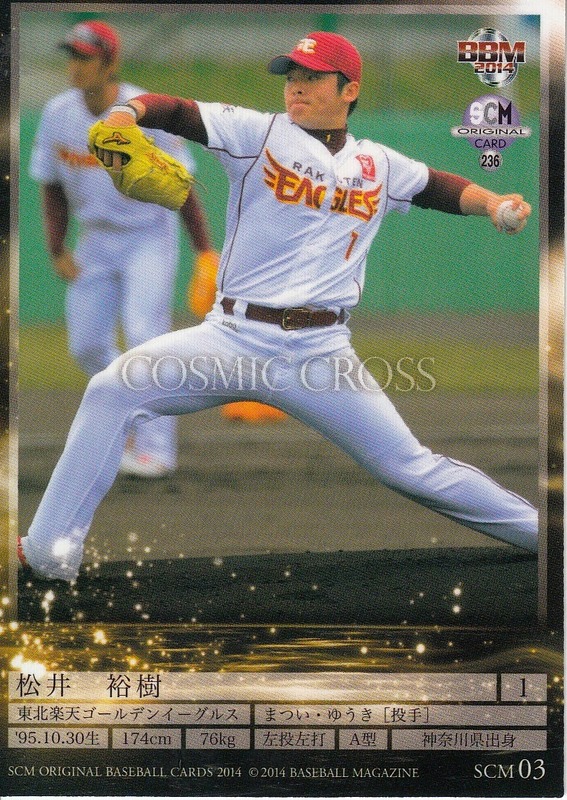 I did a little research today on this but there's nothing in Engel about there being a variant of this card and I don't think that the Calbee Collector website says anything about one either. 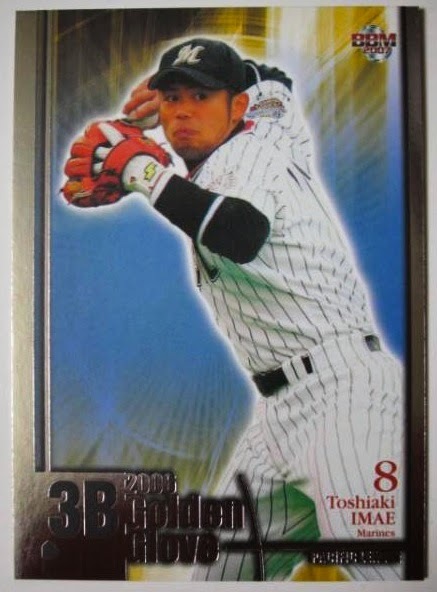 I found another card for sale on Yahoo Japan Auctions and it has the stat line also. I can't imagine that someone would go through the trouble of faking the card but leaving off the stat line so I don't think the card is a fake. 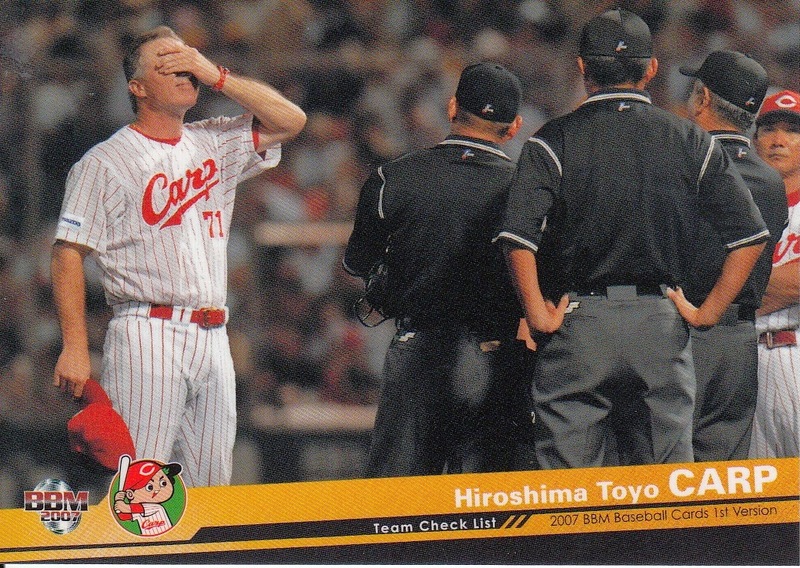 And generally when I've seen BBM reprint a Calbee card in SCM, they put some graphics and text on it to make it obvious it's a reprint. Calbee's reprints have been the same - obviously reprints. So I'm kind of stumped by this one. I will say that I got the card extremely cheaply - my winning bid was $8.50 - so if it turns out to be fake then at least I'm not out much money. (Of course, if it is fake, maybe that's why I got it so cheap - all the other bidders were wary of it.) I got the card from someone I've gotten many cards from so if it is fake, I suspect he did not know. I'd appreciate any suggestions that anyone can make about this. 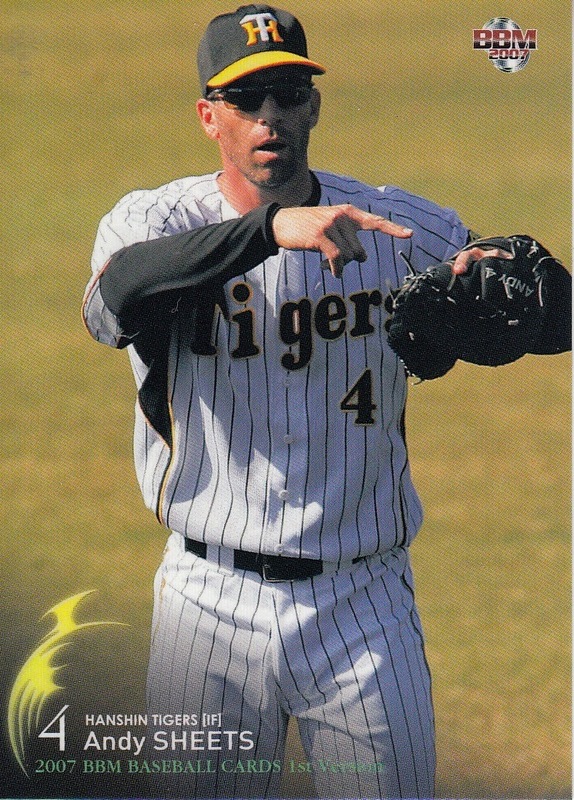 The discoverer of the card, Tommy Flanagan, stated that there was an entire series of Calbee cards featuring some little known Dragons players including Max Dubois, Yoji Nishimura and Uchiyama-kantoku but that the majority of these cards were lost. "There was a flood, see, yeah, a flood and then I got robbed. Yeah, robbed. And me and my wife...Morgan Fairchild...chased after the robbers and when we were catching up with them, they uh...burned the cards to destroy the evidence...yeah, that's what happened...that's the ticket."